David Beckham has praised his former manager Sir Alex Ferguson for the way he helped him regain his confidence after the 1998 World Cup. While playing for the Three Lions in a game against Argentina in the 1998 World Cup, Beckham was shown Red Card because he had kicked out an opposition player. England eventually ended up being defeated in that game in the penalty shootouts and with that defeat; they got knocked out of the tournament as well. That sending off incident affected Beckham’s image adversely. The English fans started hating him. He also got a few death threats. According to Beckham, that period was very difficult for him. He had lost his self confidence and he was finding it hard to concentrate on his game but because of the support that he got from Sir Alex Ferguson and the fans of Manchester United, he managed to put his career on track again. One would definitely not have expected Beckham to give these sorts of statements especially after what Sir Alex has written about him in his recently published book. In that book, the former Manchester United manager has criticized Beckham for his undisciplined behaviour towards the end of his tenure at Old Trafford. Former England international David Beckham recently announced his retirement from the sport after several years at the top level. He has been one of the celebrated players in the history of football. He represented the likes of Manchester United, Real Madrid, AC Milan, and PSG during his career. He became the first English player to lift league titles in four different countries. He has also started a wave of excitement in the United States for football. After several years at the top level, Beckham ended his career playing for PSG. There have been several rumours about what David Beckham is about to do next. Many have been suggesting that he is about to enter into football ownership when he takes stake in the MLS franchise that is about to be started in the next few years. MLS has announced that the league will be getting new teams – up to four – in the next few years. Beckham, though, has commented that it has been a difficult time to be out of football, while the decision was also equally tough as well. During his stellar career, he managed to win all major trophies. He is also one of the richest sportsmen in the world. He has been rumoured to be on the verge of investing in a franchise located in Florida. “The toughest decision I had to make was retiring when I have been involved in the sport I love for so many years, playing professional football for 22 years at the highest level. Making that decision, for me, was the toughest. I still question myself, of course, but I am 38 years old… I have had a pretty successful career. I feel it is the right time,” said Beckham. The 38-year-old star represented PSG for six months before retiring at the end of last season. French club Paris St Germain were reduced to 9 men after David Beckham was sent off just a few minutes after coming on as a substitute. PSG were playing against Evian in the French league and they were leading 1-0 in the match after just 50 min following a goal from Javier Pastore. However, they had defensive midfielder Marco Verratti sent off for a second yellow card. Just when it seemed that things could not get worse for Carlo Ancelotti’s men, Beckham was given a straight red minutes after coming on for a lunge on the Evian player, Youssef Adnane. After the match, PSG sporting director Leonardo criticised the decision of the referee to give a straight red to Beckham because it was totally unfair. He said that the referee also made several mistakes over the course of the match, but PSG managed to hold on to the victory that has put them one step closer to the title. There was also other dismissals in the match after assistant manager Claude Makelele was sent to the stands as well. Beckham has been at PSG last few months after signing in January on a five month deal. Carlo Ancelotti has been calling for the contract of the former England international to be extended. “It was always a very tense match. Nobody wanted to lose, especially Evian, who are struggling to stay up. I also believe that our team is really tired at the end of the season,” said Leonardo. As a result of the victory over Evian, PSG have been able to maintain their top position in the league. They are also having a nine-point advantage over second placed Marseille. There are only four games left in the season, which has made PSG the unofficial champions France for the first time. The former England manager Sven Goran Eriksson has revealed that he will be looking to sign the former England international David Beckham after taking over as the technical advisor of the Middle Eastern club Al Nasr. Sven Goran Eriksson has signed an 18 month contract with the club. Immediately after taking over, he was revealed that he will be looking to bring in the former Manchester United, Real Madrid, and AC Milan midfielder David Beckham. Beckham is currently available on a free transfer after leaving LA Galaxy at the end of the season. He has revealed that he will be taking a decision on his future soon. There have been no shortage of offers for the 37-year-old despite coming to the end of his career. He has been linked with several high-profile clubs in the world like Monaco and PSG. However, the riches on offer at Al Nasr may be able to persuade the midfielder to join the Middle East club according to Eriksson. He also has good relationships with Beckham after making him the captain while he was the manager of the England national team. Aside from identifying the transfer targets, Eriksson will also be working with the youth teams as well. Eriksson, meanwhile, has said that he has not been working in brief spells just for the money. “If he wants to come I’m sure they would open the gates for him. I still speak with him, although I don’t know where he will finish up. I can promise you the jobs with Ivory Coast, in Thailand and here are not for the money. Absolutely not. It’s for a love of football, seeing new parts of the world and a new football league,” said the former England manager. Beckham has also been linked with a move to QPR as well. The former Real Madrid, Manchester United, and LA Galaxy midfielder David Beckham has said that he still thinks that he has the opportunity to play for the club in the Champions League. The 37-year-old midfielder recently became a free agent after deciding not to extend his contract with the MLS club LA Galaxy. He is expected to join the European club once again after completing his five-year stint with the American club. He has been linked with a number of clubs like the Premier League club QPR and the French club Monaco. However, very high-profile clubs like Paris St Germain have also been linked with a move for the former England midfielder. Beckham has opened the door to joining the club like Paris St Germain by saying that he still feels that he has a lot to offer at the Champions League level itself. Beckham was last involved in the Champions League back in 2009 with the Italian club AC Milan. He recently ended his stint with the American club by lifting the second MLS cup in two seasons by helping the team beat Houston Dynamo in the final of the competition. The French club Paris St Germain represent the best opportunity for Beckham to take part in the Champions League once again. “I always loved it when I went back to AC Milan being back in the Champions League. I still miss playing in it, they are the games you love playing in. Of course I’d want to play in it again. We’ll see where I go next. If it’s a team that’s in the Champions League then it will be nice to be back. It’s nice to see them still playing at United,” said Beckham about his future and his former teammates Ryan Giggs and Paul Scholes, who continue to represent United. The defending champions LA Galaxy are extremely confident of retaining the title according to the star midfielder David Beckham. The 36-year-old former England international is ready to help his team left in the second consecutive title this season, as they prepare to face Vancouver Whitecaps in the play-offs before looking to get into the final rounds of the competition. Meanwhile, Chicago fire will be taking on Houston Dynamo in the other play-off round. The winner of these two matches will be playing in the MLS cup for a chance to win the title this season. Due to the fact that LA Galaxy could finish only in the fourth position in the Western Conference table, they know how to play in this play-off match. David Beckham has praised the quality within the team and also the unity shown by the players. He has said that this will hold them in good stead when it comes to securing the result against Vancouver Whitecaps. Beckham has acknowledged that it will certainly be difficult to score a goal in this match because they defend in great numbers with organisation. Due to the fact that it is just one match, they will be confident of winning against LA Galaxy. Winning this match will make LA Galaxy play against San Jose earthquakes in the next match. “I think they’ve got a lot of character as a team, a few good players as well and they’ve got a lot of unity. When we’ve played them in the past they’ve shown it is difficult to break them down and win the game. There will be many obstacles, especially with it being a one-off playoff game. It’s going to be difficult,” said the former Manchester United midfielder. San Jose earthquakes are the inform teams in the MLS right now. Both David Beckham and Robbie Keane will not be part of the squad that will play in the Champions League against Puerto Rico because the manager has decided to leave most of the squad with the view of keeping them fresh for the rest of the campaign. Alongside Landon Donovan, both David Beckham and Robbie Keane have an important role in the squad. Due to the fact that both Robbie Keane and David Beckham coming to the end of their careers, the manager Bruce Arena decided to not take these players for the match against Puerto Rico, even though its a bit like Barcelona leaving Lionel Messi at home! He has said that this is the third game for the club in the space of a week, which has put tremendous pressure on the resources he has at its disposal. Further, it would have meant that David Beckham and Robbie Keane would have been overused. So, he decided it is best for them to remain home under this situation, which would mean that they would be fresh for the remainder of the season. LA Galaxy come into the match with comfortable lead under the favourites to go to the next round. Following this match, LA Galaxy will be having only a few days of recovery before they take on Toronto. “We’re just in a week where we’re playing three games. We’ll have some different players on the field that we did in the first game. But we’ll have a mixture of players. When you’re out awhile, it takes some time to get fit. I was a little tired towards the end of last week when I came out, but I think if I had to go 10 or 15 more minutes, then I could have gone through it. The only caveat to that is that this is a different environment. It’s hotter, it’s humid and that could play into it,” said Bruce Arena. The star midfielder of Real Madrid, Kaka, is reportedly on the radar of the American club Los Angeles Galaxy. The club wants an experienced midfielder to replace David Beckham in the team. Beckham’s contract with Galaxy will expire in December this year and most probably, the English midfielder would be leaving the club after that. According to some reports, Beckham, who is 37 years of age now, is planning to retire from professional football. So, Galaxy is looking for a midfielder of the caliber of Beckham and Kaka is the first choice of the club. However, Kaka is also on the radar of his former club AC Milan and the Milan authorities are still pretty confident of signing Kaka before the closure of the transfer window. However, Beckham hasn’t yet confirmed that he would leave Galaxy after the completion of his contract. A few days ago, on being asked about his future with Galaxy, Beckham had said that he hadn’t yet thought about signing a new deal with Galaxy. He was not sure at that point of time. Beckham has been playing for Galaxy since the last 5 years. He had signed for Galaxy in 2007. He had joined the American club on a contract of 5 years. Beckham featured for Galaxy for the first time in a pre season friendly match against Chelsea. He came to play in the 78th minute of the match. Immediately after joining the club, Beckham was announced as the captain of Galaxy. 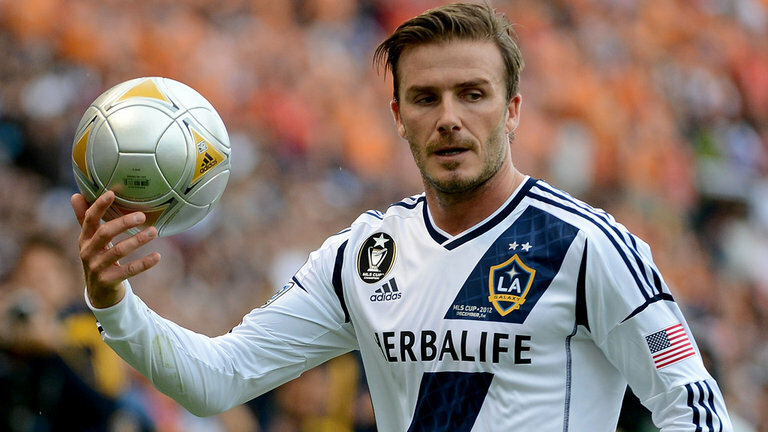 During his 5 year tenure at Galaxy, Beckham has been placed on loan two times. On both the occasions, he played for AC Milan. Beckham had arrived in USA with an amazing reputation and Galaxy had massive hopes with him. But, the Englishman hasn’t been able to perform exquisitely for the club. But, even after that the club doesn’t want to release Beckham. According to some reports, the authorities of Galaxy are still trying to convince Beckham to re-sign for the club. LA Galaxy star David Beckham has admitted that he does miss the ability to live in the United Kingdom. David Beckham is regarded to be one of the icons of the British football after having represented some of the biggest clubs in the world including the likes of Manchester United, Real Madrid and AC Milan. He is currently playing for MLS side LA Galaxy, but came extremely close to moving back to Europe with French club Paris St Germain. However, negotiations broke the final stages between the former England midfielder and the French club. This saw David Beckham extend his deal with the MLS side by two more years. Many think that it could be tough to see the 37-year-old return to England due to the fact that both his children and wife enjoy staying in the United States. David Beckham has already said that his preference will be to stay where his kids and wife enjoy the most. Hence, it is looking unlikely that Beckham will be back for a permanent stay in the United Kingdom. Beckham recently sold his mansion in the UK, but he recently admitted in an interview that he does miss life in England. “I am always tempted to come back to England but it’s a critical time for [my] children” he told Man Utd news. “I do miss London. Going for pie and mash with my mum and dad, and also going to see my nan. I haven’t got the call yet. But my view on that is it should be an Olympian. That’s my view. If I’m offered it, it would be hard to say no,” said David Beckham in a recent interview. David Beckham’s current contract with the MLS club does not come to an end until 2013. He could be set for an England return as part of the Team GB squad.